It’s Monday and I don’t know what you did this weekend but I finished one book (Americanah) and started another (Descent). Since I quit teaching, reading has returned as my favorite thing to do. I always had the time but never took it, something about the frenzy of teaching that made it so I could only make time to read books I wanted to during the summer. 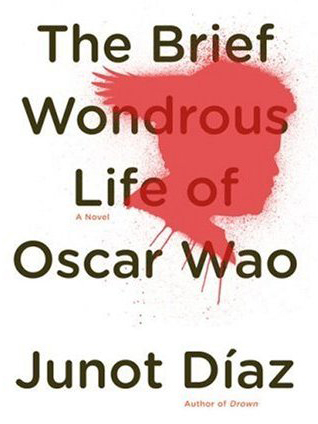 Several summers ago I read The Brief Wondrous Life of Oscar Wao by Junot Diaz. I’d read Drown, his collection of short stories and so I knew the novel would be good because you can tell a lot about a writer by a short story and his were wonderful, compact tales punched with reality. Recently, the BBC polled several U.S. critics in search of the best fiction book of the 21st century. They ended up awarding it to The Brief Wondrous Life of Oscar Wao. Published in 2007, it took Diaz eleven years to write and it’s no wonder. The footnotes kept me up doing late-night searches on Wikipedia and reading about the history of the Dominican Republic. And it’s a fun and funny book, not something I’d usually write about a book that explores socio-political history, love, the immigrant experience, and what it means to be an American (and who gets to call themselves American). But that’s the talent of Junot Diaz. I don’t know what he’s like in person but I really liked Oscar Wao. Oscar is not a typical hero protagonist and is in fact, a huge nerd. If you were a weird, socially awkward sci-fi kid who loved Lord of the Rings and comics, you’ll love him too. If you click the link to this article, you can see the top 20 books the critics selected. I was sad that my beloved favorite The Goldfinch didn’t make the top 20 but then that is how it is with books and critics. Many of my favorite books (The Four Seasons by Stephen King) will never make a critics list. But that’s for another blog. In the meantime, check out this list and head to your local library (you do have a library card, don’t you?). Of the 20 on this list, I’ve read and enjoyed #’s 1, 5, 6, 11, and 13 (now you have to click the link!). How about you, what are you reading these days? I wish I had the discipline to read modern lit that systematically. Having said that, I have a favorite post 2000 novel, too, and it’s not on the list. It is Marina Lewycka’s “A History of Tractors in Ukrainian.” It is a great novel about the nature of aging, immigration, and a variety of other topics. It is set in England where a Ukrainian refugee family raised their children after World War II. The widowed 84 year old father ends of marrying a 36 year old emigre from the post 1990 emigration from Ukraine to England. It does not go over well with the two 50+ year old daughters, and the results are hilarious! Another good one for anthropologists is Mischa Berlinski, Fieldwork: A Novel. It satirizes the UC Berkeley Anthropology Department, and the whole academic game there. The anthropologists ends up in prison, after becoming deeply involved with an ethnic group in northern Thailand. She becomes deeply enmeshed in the group she set out to study, and ends up murdering a missionary with a sniper rifle. Surprisingly for a novel of the genre, the missionary comes off as being a sympathetic figure, while anthropology doesn’t do so well! It’s a great story which is well put together, and I would recommend it to anyone contemplating field work. There’s two more books for the “Want to Read” shelf! Thanks for the shout-out Julie!